Due to the 1000byte limit, I'd imagine it would be about 30+ separate messages to form this file. To reform the file, we would need to mark each message in proper order to concatenate it. Do we need to turn bytecode into base64 for decentralized storage? What other issues might we encounter? If we can get a test scenario working, technically we can store/retrieve/embed data onto our websites/apps without needing a centralized server. We could add a "transient data" attachment that can have larger size, but is only kept in the blockchain for a limited time, say 24 hours. The hash of the complete attachment will be included in the transaction bytes that are signed and will be kept permanently, so that transaction signature can always be verified, but the actual data will be deleted after this expiration period. Then the bloat to the blockchain and extra traffic will be limited to those attachments for the last 24 hours. This wouldn't be that useful for images for goods that sellers keep in stock permanently, but for short lived items, or even message with picture type of attachment, may work. Just an idea. Not the answer you're looking for? Browse other questions tagged blockchain nxt decentralization storage or ask your own question. Are NXT messages stored on the blockchain and are they encrypted or publicly viewable? In NXT, which files store the contact addressbook data? How does OpenBazaar differ from NXT decentralized marketplace? 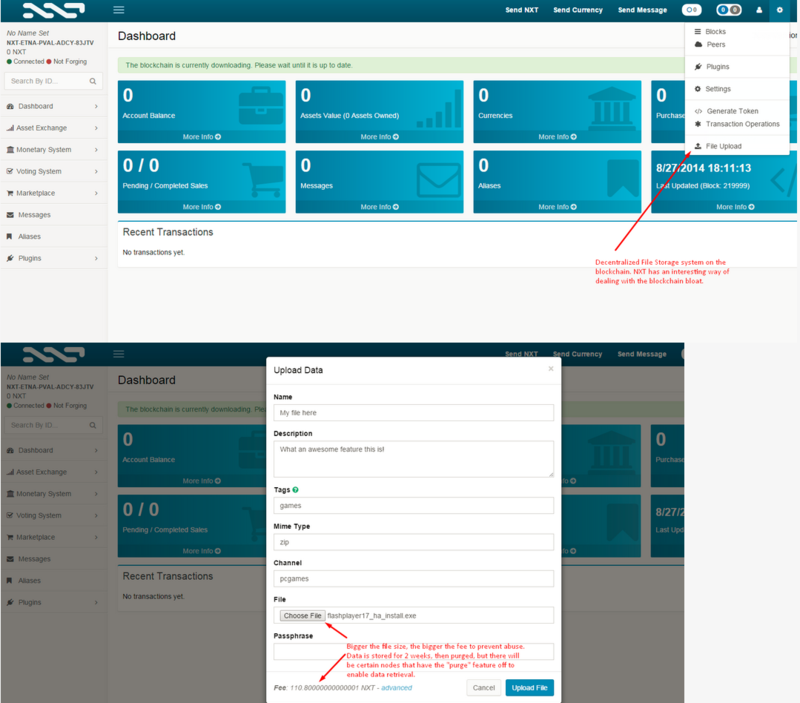 Decentralized Data Storage System in NXT - How do you disable the 2 week data pruning? How long do files stay on the Decentralized Data Storage blockchain when using NXT's Data Cloud Feature?